The British arm of Toys R Us has been teetering on the brink of collapse for several months now following it's american parent company filing for bankruptcy protection in September 2017 that triggered a downsizing programme through rapid store closures that are likely to see at least 200 of it's 866 US stores close in an attempt at reducing its $5 billion debt mountain which dates back to its leveraged buy out of 2005 that costs Toys R Us $400 billion a year in interest payments. 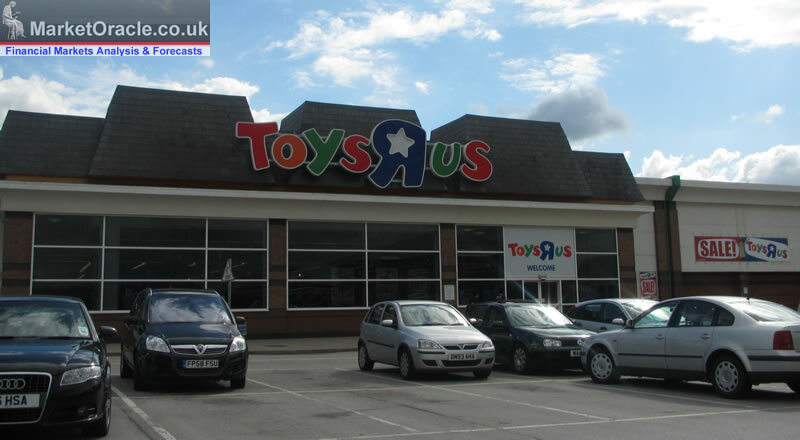 So it should not come as that much of a surprise that the British arm of Toys R Us with its 106 stores could now be heading for at least a similar fate if not a 'Woolworth's' moment, that could unfold rapidly, all within a matter of days that could see the retailer plunged into administration with the potential loss of 3200 jobs. The triggering factor for which is a £30 million black hole in its employees pension fund that the Government Pension Protection Fund is demanding a near immediate payment of £9 million into to cover 3 years worth of past pension contributions, against which the distressed retailer is offering just £1.6 million and thus the current crisis. The key point is that the PPF would be forced to step in if the retailer went bust and the calculation being made is that if Toys R Us lingers on for another year before going bust then by that time the pension black hole could be twice the current estimated size. However Toys R Us is just the tip of the retailer sector crisis that I have repeatedly been warning of ALL YEAR as I expected Britain's retail sector to face a perfect storm, perhaps several 'Woolworth's' moments that could see at least 1 major retailer go bust, and my warnings were not just focused on the the smaller players such as Toys R Us but right from the top, Britain's largest retailer TESCO downwards, most of which have increasingly been suffering all year. Fundamentally, it is the same old story of giant bricks and mortars retailers being killed off by the internet, by the likes of Amazon and a myriad of other online only retailers that have sprung up over the past decade or so. Against which the bricks and mortar retailers just cannot compete in terms of price given their vastly differing overheads. And the basic flaw in Toys R Us is that the stores were JUST TOO BIG! 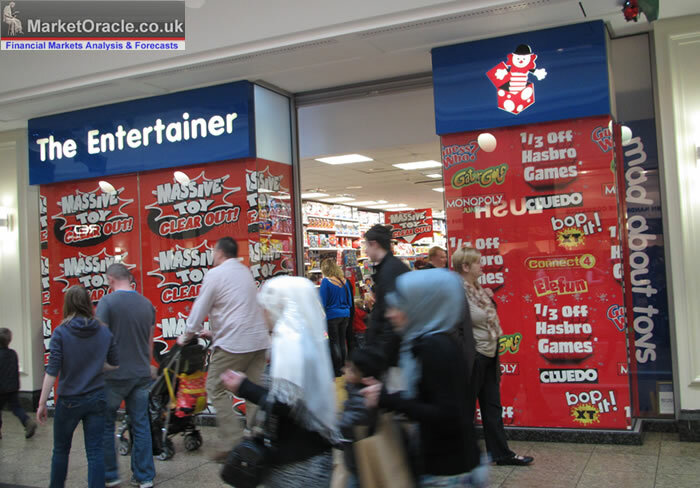 Which is why they are suffering whilst smaller store retailers such as The Entertainer toy ship chain that continues to do well, for now at least. 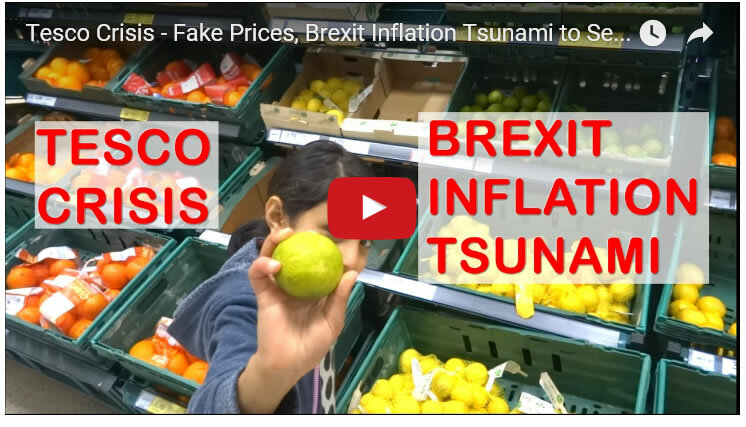 And where for this years perfect storm we also had the persisting dynamics of soaring inflation as a consequence of the BrExit sterling plunge, which in the latest data remains stubbornly above 3% CPI. 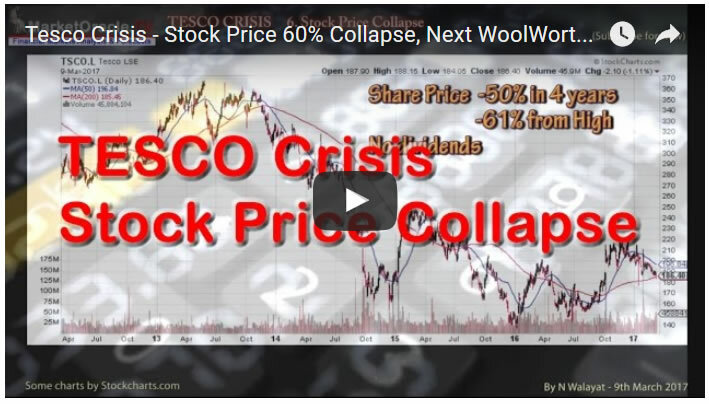 Therefore generating year long upwards pressure on shop prices as suppliers restocked at much worse exchange rates that already depressed retailers such as the big supermarkets had delayed fully implementing. And then the retail sector had to contend with STAGFLATION, one of wage growth of just 1.8% persistently lagging behind the so official inflation rate of CPI 3.1% acting to squeeze the purchasing power of worker earnings. However in reality actual inflation is far higher with RPI at 4% and real demand adjusted inflation at 5.1% implying that the UK economy has been in deep stagflation for the whole of this year, one of the real terms erosion of the purchasing power of earnings, i.e. falling demand which increases the risks of a recession as the economy enters a depressed stagnant state where workers are not able to maintain consumption of goods and services resulting in economic depression with inflation i.e. stagflation. 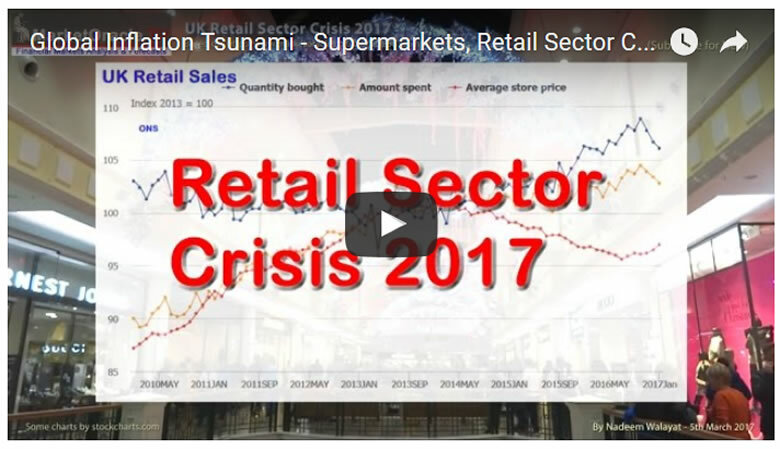 In additional to my many articles, my following videos further illustrate the unfolding retail sector crisis of 2017 that I warned threatened to claim at least 1 major retailer in a 'woothworths' moment. 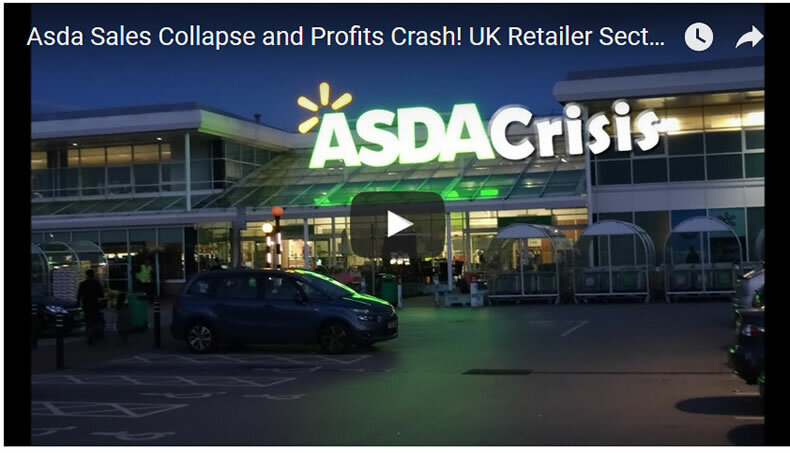 Whilst my most recent video in the retail sector crisis series took a look at the prospects for Britain's third largest retailer, Asda. In terms of shoppers, well if Toys R Us does go bust then one can expect deep discounts in individual store closing down sales as and when they are announced, in fact there ARE going to be closing down sales no matter what happens in respect of the pension fund, it's just a question of how quickly and how many stores, i.e. at least 1/3rd of Toys R Us stores were likely to close anyway! Though shoppers should remember to act fast on store closure announcements as most of the stock will go fast. Whilst retail investors have had a lucky escape because Toys R Us has toyed with an IPO several times over the past few years, with 2017 having been seen as the year to float that may still materialise in some form, perhaps an asia only stores float without the debt burden could convince institutional investors to play. The bottom line is that Toys R Us is just the tip of the ice-berg of what I expect to follow during early 2018, as the failure of retailers to perform during November and December 2017 will put many into severe distress during January and February 2018 as the retail sector crisis continues to unfold.